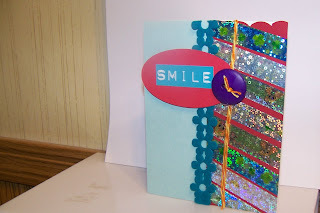 Here is a card for Moxie Fab Tues Trigger. What do You think? I used tape for stripes, felt to center boarder, tine and button. Cut <oval3> Art Philosophy Cricut cartridge for tag and added "smile "
I've had my eye on this new tape but wasn't sure what I could do with it. Your card has inspired me!